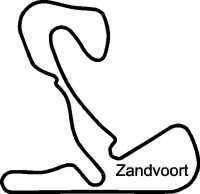 Zandvoort Circuit graphic decal / sticker. Although there were plans for races at Zandvoort before World War II, the first street race was held on June 3, 1939. A real circuit was not built until after the war, built on communications roads built by the German army during its occupation in the Second World War. The circuit mainly designed by John Hugenholtz. The circuit was inaugurated on August, 7, 1948. Next year, in 1949 the circuit hosted the Zandvoort Grand Prix. The following year, the race was called the Dutch Grand Prix, and it was included in the Formula One World Championship in 1952. It remained on the F1 calendar for 30 out of the next 34 years. In 1985, the Dutch Grand Prix was held for the last time.